Daniel Start’s dazzling travel guide book to France, for families and adventurers alike. Dip in to the emerald-green plunge pools of Provence and swim beneath the great châteaux of the Loire and Dordogne. Discover the unspoilt crater lakes of the Massif Central or relax in secluded hot springs in the woodlands of the Pyrénées. Recommendations for canoe trips, bike rides, campsites, restaurants and farmshops. Wild Swimming France contains all the practical information you’ll need to lure you off the beaten track to over 400 amazing locations. With stunning photography, 15 maps, and detailed directions, grid references and walk-in times. Buy the Print Book here. You can buy the Kindle or print book from Amazon here. France has one of the most diverse and magnificent landscapes in Europe – with a cuisine and culture to match. Its rivers, lakes and waterfalls are the cleanest in Europe and its summers reliably hot – and all just a train ride away. In vast areas of unspoilt French countryside there is so much to discover, from the tranquil river beaches of the Ardèche and the secret waterfalls of the Languedoc, to the shimmering aquamarine pools of Corsica and the Alps. Daniel Start is an award-winning writer and photographer, author of Wild Swimming (2008) and Wild Swimming Coast (2009). He has spent the last three years camping and swimming in France, seeking out its natural wonders and getting sunburnt along the way. Married with a baby daughter, he works as an environmental consultant and lives at the confluence of two rivers in rural Somerset. I am from the “cevennes” region in fance and This book has been my bible for the past 5 years. Each year i go off on a 5 day solo trip and i always plan according to this book. It has brought ne countless adventures and memories, thank you!!!! – Human activity even at a moderate level kills this ecosystem. – another huge issue is sun screen, it is terrible for the rivers (and oceans). We don’t realize that it washes off directly into the river and it is highly polluting. If you can avoid putting it on or maybe buy a biodegradable one that would be great. I could go into more detail but it would be too long. Of course i don’t mean to be a downer or tell people not to buy the book. On the contrary. Rivers are the most beautiful thing (in my opinion) natures has to offer. Please tell people around you about this. Daniel, if you read this it would be great if you could include this “warning” on your site on in your book if you publish again. Don’t hesitate to contact me (alex.alonso03@gmail.com) if you’re ever in paris, i would love to have dinner or a drink to talk river!!!! Absolutely ASTOUNDING book… just got back from France having swam at four of the sites (coincidentally two are photographed above; Chenonceau and Pont Du Diable). Brilliant brilliant accurate guide to swims of a lifetime. Have hard copy. Superb book. Has inspired countless adventures. Thank you for opening up a new way to see a country and escape the tourist hordes. Done it ! !Thanks I am off to France! Bought download now can’t find download!? We have used this heavily in our exploration of the South East of France. We live in Antibes and there are many clues (canyons) here. Great for planning beautiful Hikes as well as swims. Best used in conjunction with a topo map but even Google Maps is enough to help with the directions. Just spent an idyllic 2 weeks in Provence. 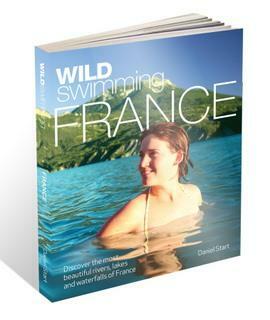 Planned many of our days using Wild Swimming France. What can I say…. Swam though Le Styx in the Verdon gorge, canyoned the Haut Jabron, dived into the main pool at Sillans La Cascade, rafted from Castellane to Couloir Samson, got lost looking for the gorges of ChateauDouble, lept into the lake at Bauduen, and even spent a couple of hours by the pool! This book added a new dimension to our Annecy holiday; the locations were accurately described and inspired us off the beaten track and into some beautiful water. I can’t believe I reached 30-something before I experienced night swimming; just glorious! What a great idea for a book – so many travelers are looking for French hideaways just like this!